American football player/ defensive tackle Devon Still (right) and his daughter Leah Still are seen arriving at Desigual fashion show during Spring 2016 New York Fashion Week on September 10, 2015 in New York City. 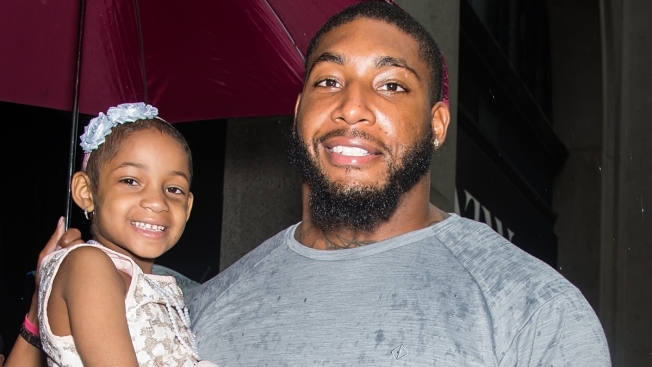 Devon Still happily announced earlier this week that his daughter Leah was done with her final cancer treatment, but it was a day he initially feared might never come. "When we first started off, it seemed so far away,'' Still told TODAY.com. "When she received her first treatment and it didn't work, that was the scariest moment. I thought I would end up losing my daughter." Leah, 5, has been an inspiration in the fight against pediatric cancer since she was diagnosed with stage 4 neuroblastoma in June 2014 and given a 50-50 chance to survive by doctors. Devon, a defensive lineman with the Houston Texans, documented her battle on Instagram, which gave him a chance to reflect this week on how far she has come since that scary time 18 months ago. "I looked through all the different pictures from when we started until the end, and I feel very blessed that we were able to make it through this,'' he said. "Social media really helped a lot during the dark times."